In this exclusive parcel, you will receive 6 bottles each of the wines featured. Along with just a handful of other truly exceptional Tuscan estates, Tenuta dell'Ornellaia makes a rightful claim to being the greatest wine estate in Italy. Along with Sassicaia it is sited in the Bolgheri sub-region and together with it’s super rare pure merlot cuvee; Masseto, is considered amongst the world’s truly great wines. As part of Tenuta dell ‘Ornellaia’s latest release, we are delighted to include the sensational and very well priced second wine of Ornellaia; Le Serre Nuove also from the 2015 vintage. Also included for the first time is their brilliantly accessible and focused third wine, the 2016 Le Volte. 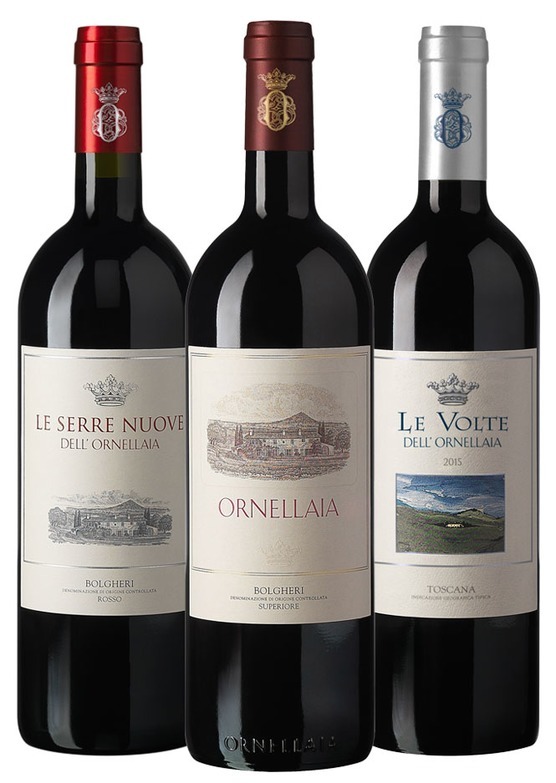 Secure your Ornellaia wines with our exclusive offer. UB* - Under Bond This wine is available En Primeur. The price shown is not inclusive of UK duty and VAT, which is payable at the prevailing rate (on publication duty was £25.98 per case of 12 x 75cl bottles, plus 20% VAT) upon delivery from bond. Wines will be shipped from summer 2018 and we'll contact you once they've arrived. You will have the option to take delivery, or keep your wine in professional storage.